Well, Jennifer can rest easy because McCollum helped lead the Blazers to a victory in their first game of the NBA playoffs on Sunday against the Oklahoma City Thunder. McCollum had 24 points, although he needed an inefficient 24 shots to reach that mark and added six rebounds and three assists. McCollum scored 11 of his points in the first quarter, which helped open up a 39-25 lead over Thunder. Portland hung onto the lead and took Game 1, 104-99. 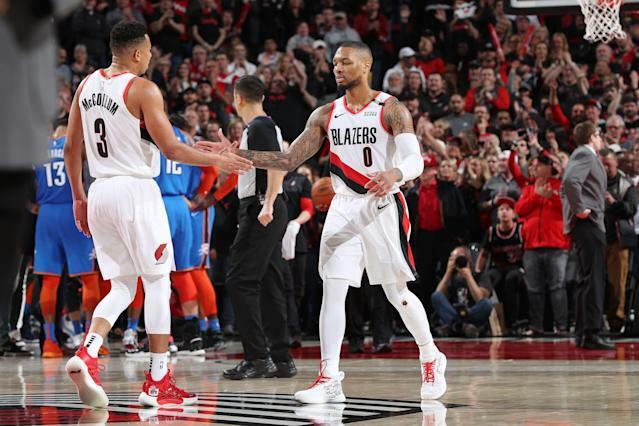 The win was huge for the Trail Blazers, who have been swept out of the first round the last two playoffs. The Golden State Warriors, whom Jennifer is a fan of, took them out in 2017, while the New Orleans Pelicans upset the then-No. 3 seed Blazers last summer. Up next, maybe McCollum could squash his beef with Kevin Durant. Can Jennifer work her magic again? As soon as the Blazers hung onto their win, plenty of other fans reached out to Jennifer to see if she could inspire their own teams. yo...can you send this energy to @chicagobulls so they can win the draft lottery?